"Let It Be," a McCartney composition, was recorded January 31, 1969 at Apple Studios. Overdubs were added on April 30, 1969 and on January 4, 1970, the last Beatles recording session, with Lennon absent. The original session produced both the single and album versions. It was released in both the UK and the U.S. on March 6, 1970 and March 11, 1970 respectively. McCartney said that the song's inspiration came from a dream he'd had about his mother during the 1960s. Citing that the 1960s had been a hard decade because of the Beatles' rise to fame, he said that the dream about his mother, who died when he was only fourteen, gave him strength. 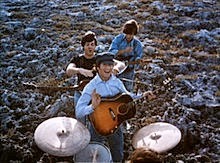 On the single version, McCartney sings lead vocal and plays piano. Lennon plays bass and adds vocal harmony. Harrison plays lead guitar and also adds vocal harmony. Billy Preston plays organ and Starr plays drums. Some sources say that Harrison played bass and and Lennon lead. On the album version, Harrison plays a Lesley guitar, which sounds like an organ. Billy Preston doesn't play. Orchestration was dubbed in by Phil Spector. Still other sources say that Harrison and Lennon both played lead, with Lennon playing his Epiphone Casino and Harrison a Gibson SG. Tapes of the sessions would seem to bear this out.